DEC invites the public to comment about a proposed remedy to address contamination related to the 85 Jay Street Site (Brooklyn), within New York's Brownfield Cleanup Program. Public comments about the proposal will be accepted through December 2, 2017. Click the web link above at additional information to learn about the proposal and how to comment. Project documents can be reviewed at: Walt Whitman Branch, Brooklyn Public Library, Attn: Janet Conton, 93 Saint Edwards Street, Brooklyn, NY 11205; phone: 718-935-0244 --and-- Brooklyn Community Board District 2, Attn: Shirley McRae, 350 Jay Street, 8th Floor, Brooklyn, NY 11201; phone: 718-596-5410. On Saturday, December 2, 10:00 AM turn trash into treasure or at least use eco-friendly materials to wrap all those packages for under the tree or for any other special day. Come ready to get a little messy as we explore various wrapping materials that are eco-friendly, kid-friendly and fun. Adults must accompany children. This program is free of charge, but space is limited. Please call the Center at 518-475-0291 to register by Wednesday, November 29. Join us as we discover the coming of winter, both in the pages of books and outdoors. A naturalist will read a story, and then we’ll go walk outdoors to explore some of the themes in the book. We’ll end by completing a craft in the visitor center. All are welcome, but the program is most appropriate for children ages 3-7. Adults must accompany children. Join in on Saturday, December 2, 4:00 PM as we survey owls at Five Rivers. Field parties will visit likely owl roosts, then gather to compare findings. Space is limited. Please call 518-475-0291 to register by Monday, November 27. DEC invites the public to comment about a proposed remedy to address contamination related to the 1176 South Park Avenue Site 3 (Buffalo), within New York's Brownfield Cleanup Program. Public comments about the proposal will be accepted through December 4, 2017. Project documents can be reviewed at: Buffalo & Erie County Library, 1 Lafayette Square, Buffalo, NY 14203. The New York State Department of Environmental Conservation (DEC) will host a public meeting to discuss the state’s Young Forest Initiative and habitat management goals at the Doodletown Wildlife Management Area (WMA) on Monday, December 4, at 6:00 p.m. at the town of Copake’s Park Building/Community Center, 305 Mt. View Road, Copake. For more information please click the URL or contact DEC Region 4 using the information listed above. Join members of the Hudson-Mohawk Bird Club for their monthly speaker series on Monday, December 4, 7:00 to 9:00 PM. Details for this month’s program, presented by Amanda Dillon, are at https://hmbc.net/content/birds-and-avian-research-albany-pine-bush. Availability Session Location: Utica Public Library, 303 Genesee Street, Utica, NY. DEC invites the public to this informal session to discuss cleanup activities about to begin at the Old Chenango Canal Site (East Side of Rte. 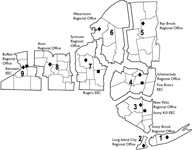 12, Utica), within New York's State Superfund Program. Stop by anytime during the session to ask questions and discuss the upcoming activities. Click the web link above at "Additional Information" to learn about the site, the upcoming cleanup, and the availability session. Project documents are available for review at: Utica Public Library, Attn: Sara Billman, 303 Genesee Street, Utica, NY 23501; phone: 315-735-2279. DEC released a 3rd draft management plan for mute swans in New York State in September 2017. Read the plan on the page listed above and submit your comment by 12/6/17. Sub Basin work groups are working to advance projects and initiatives to achieve the goals of New York's Great Lakes Action Agenda using a place-based, ecosystem-based management approach. This is a great way to connect, coordinate and collaborate with state and federal agencies, local governments, academic institutions and other key partners to advance local project needs. This meeting will be held at the Gouverneur Community Center, 4673 NY 58, Gouverneur, NY 13642. NYS Great Lakes stakeholders are invited to participate. Anyone wishing to attend MUST rsvp at least one week in advance. For more information or to make reservations please email Emily Sheridan @ greatlakes@dec.ny.gov. Sign up for one or more workshops to learn how to connect your students to nature! CTLE credit hours may be available for select programs. Registration required; call 716-683-5959 to sign up. DEC invites the public to comment about a draft plan to investigate contamination related to the Main and Hertel Site (Main St., Buffalo, Erie Co.), within New York's Brownfield Cleanup Program. Public comments about the draft plan will be accepted through December 7, 2017. Project documents can be reviewed at: Frank E. Merriweather, Jr. Library, 1324 Jefferson Ave., Buffalo, NY 14208; phone: 716-883-4418. DEC invites the public to comment about a Draft Long-Term Monitoring Plan to evaluate the completed remediation of Onondaga Lake. Public comments about the draft plan will be accepted through December 7, 2017. A public open house also has been scheduled to discuss the draft plan: November 9, 2017 at Destiny USA, 6th Floor, 9090 Destiny USA Drive, Syracuse, NY. Two identical sessions are planned: 2:00-4:00PM and 6:00-8:00PM. Stop by at any time during either session. Click the web link above at "Additional Information" to learn about the draft plan, the public open house, and how to comment. There you can also access the draft plan electronically, and learn where document repositories maintain the draft. This Climate Smart Communities (CSC) webinar will focus on the resources, decision tools and Cooperative Extension Team from the Cornell Climate Smart Farming Program that can help farmers increase resiliency to climate change, as well as the support local governments can provide to the farming community. Please note that this webinar begins at 9:00 AM (rather than the usual start time of 10:30 AM). Attendance at this event is only available online. Please see the URL under "Additional Information" for details on how to use your computer to connect to the webinar. Great Lakes stakeholders are invited to participate. Anyone wishing to attend MUST rsvp at least one week in advance. Together, kids and their parents or caregivers can enjoy a different, fun, hour-long outdoor activity each week. For children in grades K through 5. No registration required. 1115 State Route 86, PO Box 296, Ray Brook, NY 12977-0296, Phone: (518) 897-1200, E-mail: r5.ump@dec.ny.gov. New York State Department of Environmental Conservation (NYS DEC) has completed a Draft Unit Management Plan (UMP) for the Sentinel Range Wilderness. NYS DEC will be holding a public meeting on December 7th, 2017, at 6:00 p.m. Written comments are welcome and will be accepted, by mail or e-mail, by the contact person listed above until December 22, 2017. The Sentinel Range Wilderness is located in the Towns of Jay, Keene, North Elba, and Wilmington in Essex County, New York. DEC has received a Brownfield Cleanup Program (BCP) application and draft remedial investigation work plan for a site known as Avant Gardner, site ID #C224258. This site is located in Brooklyn, at 140 Stewart Ave. and 111 Gardner Ave. Public comments about the application and draft investigation plan must be submitted by December 8, 2017. Click the web link above at "Additional Information" to learn about the site and how to comment. Project documents are available at: Brooklyn Public Library, Williamsburg Branch, 240 Division St., Brooklyn, NY 11206 --and-- Brooklyn Community Board No. 1, 435 Graham Ave., Brooklyn, NY 11211. DEC has received a Brownfield Cleanup Program (BCP) application for a site known as Bisonite Paint Co., site ID #C915010. This site is located in the Town of Tonawanda, in Erie Co., at 2268 Military Road. Public comments about the application will be accepted through December 8, 2017. Project documents can be reviewed at: Tonawanda Library, 333 Main St., Tonawanda, NY 14150. 625 Broadway, 5th Floor, Albany, NY 12233, Phone: (518) 473-9518, E-mail: catskillpark@dec.ny.gov. The Draft Guidance for the Siting, Construction, and Maintenance of Single-Track Bike Trails on Forest Preserve Lands in the Adirondack and Catskill Parks (Management Guidance) provides guidelines solely for the management of the New York State Department of Environmental Conservation (NYS DEC) single-track bicycle trails (bike trails) on Forest Preserve lands. Comments are welcome and will be accepted by the contact person listed above until December 8, 2017. Learn the medicinal values of the wild herbs that grow in Reinstein Woods. For adults and children ages 12 and older. Registration required; call 716-683-5959 to sign up. Some animals stay active during the winter. Others settle in for a long-term snooze. On Saturday, December 9th @ 10 Am come and take a short walk with us as we look for signs of animals preparing for the cold months ahead and talk about their survival tactics. Join Five Rivers staff on December 9 at 2:00 pm as we play games and discover how and where animals spend the winter. Many people think of hibernation, but there are other ways animals survive the coldest months. We’ll explore some of the creative adaptations of our regional wildlife as they prepare to survive this challenging season. DEC invites the public to comment about a draft plan to investigate contamination related to the Joey's Cleaners Site (East Gun Hill Road, Bronx), within New York's Brownfield Cleanup Program. Public comments about the draft plan will be accepted through December 11, 2017. Project documents can be reviewed at: Bronx Public Library - Allerton Branch, 2740 Barnes Avenue, Bronx, NY 10467; phone: 718-881-4240 --and-- Bronx Community Board No. 12, 4101 White Plains Road, Bronx, NY 10466; phone: 718-881-4455. There will be two public information sessions on 12/11/17 to discuss plans for the Frontier Town Campground, Equestrian, and Day Use Area. This is a new, accessible, public campground proposed at the site of the former Frontier Town theme park in the town of North Hudson, Essex County. Public comments on the Mute Swan Revised Management Plan must be submitted in writing to the contact listed above no later than December 13, 2017. Please take notice that the public comment hearing originally scheduled for September 19, 2017 at the Suffolk County Water Authority located at 260 Motor Parkway, Hauppauge, New York 11788 was cancelled and is rescheduled for Thursday, October 26, 2017 at 6 p.m. at the same location. In addition, the deadline to submit public comments on the Draft Mute Swan Management Plan has been extended from December 6, 2017 to December 13, 2017. The New York State Department of Environmental Conservation (NYS DEC) has issued a Request for Application to solicit applications from public and private universities, or non-profit institutions, to operate a pollution prevention institute in New York state (Institute). To apply for this opportunity, log-in or create an account in the NYS Grants Gateway at: https://grantsgateway.ny.gov or https://grantsgateway.ny.gov/IntelliGrants_NYSGG/module/nysgg/goportal.aspx and search for Pollution Prevention. The question and answer period ends on November 8, 2017. Applications are due December 14, 2017. DEC has received a Brownfield Cleanup Program (BCP) application for a site known as 215 North 10th Street, site ID #C224229. This site is located in the Borough of Brooklyn, within the County of Kings, and is located at 215 North 10th Street. Comments regarding the application must be submitted by December 15, 2017. A copy of the application and other relevant documents are available at: Brooklyn Public Library-Williamsburgh Branch, 240 Division Avenue, Brooklyn, 11211 --and-- Brooklyn Community Board 1, 435 Graham Avenue, Brooklyn, 11211. DEC has received a Brownfield Cleanup Program (BCP) application for a site known as ENRX Annex Site, site ID #C915325. This site is located in the City of Buffalo, within the County of Erie, and is located at 50 Hannah Street. Comments regarding the application must be submitted by December 15, 2017. A copy of the application and other relevant documents are available at: the Buffalo and Erie County Public Library, 1 Lafayette Square, Buffalo 14203. The New York State Department of Environmental Conservation (DEC) has received a Brownfield Cleanup Program (BCP) application for a site known as Former Mohawk Furniture, site ID #C518025. This site is located in the Village of Broadalbin, within the County of Fulton, and is located at 5 Mill Street. Comments regarding the application must be submitted by December 15, 2017. A copy of the application and other relevant documents are available at: Broadalbin Village Hall, 16 West Main Street, Broadalbin, NY 12025. This half day workshop will help attendees learn about how to recover from an EAB infestation. DEC, ISA, and CNLP credits will be available. Early registration is due by December 7th. Enjoy hearing a nature story, followed by a guided walk in the woods. For children ages 3 to 7. Registration required; call 716-683-5959 to sign up. Bring your binoculars on this winter stroll to look for birds and other wildlife. Fight those winter blues by getting outdoors in the brief daylight and enjoying the view. This mile-long amble will take place on relatively flat terrain. All are welcome, from beginning birders to experts. If you don’t have binoculars, we have a few to loan. Join a guided nature walk through the woods. No registration required. Please join us on Saturday, December 16, 2:00 PM for this family-friendly event, which will incorporate our displays and a live animal presentation to demonstrate the ways animals in our area survive the winter. If weather permits, we will also venture outside for a half-mile walk on relatively flat trails to see some winter wildlife behaviors in action. This event is most suitable for children ages 8 to 12. Adults must accompany children. The NYS Invasive Species Advisory Committee will meet on Tuesday, December 19, 2017 from 10:00 a.m. to 2:00 p.m. at the Department of Agriculture and Markets central office (10B Airline Drive, Colonie). Due to concerns that some commercial fishers will be unable to attend the Commercial Quota Meeting on November 28, 2017, a 2nd meeting has been scheduled for Tuesday, December 19, 2017. The purpose of these meetings is to discuss the distribution of NY commercial quota of bluefish, scup, fluke and black sea bass for the 2018 fishing year and propose appropriate open/closed periods and trip limits. These meetings are your best opportunity to participate in the development of the 2018 commercial quota distribution plans. Final decisions will not be made until after the December 19 meeting. Enjoy a lantern-led evening walk as we celebrate the longest night and the return of light. Discover solstice traditions from around the world, search for nocturnal animals, and end the evening with warm drinks and snacks. Material fee $5.00/person, children ages 5 and under free. Registration required; call 716-683-5959 to sign up. DEC has received a Brownfield Cleanup Program (BCP) application and Draft Remedial Investigation Work Plan for a site known as 157 Great Arrow Avenue, site ID #C915326. This site is located in the City of Buffalo, within the County of Erie, and is located at 157 Great Arrow Avenue, Buffalo, NY 14207. Comments about the application and draft Remedial Investigation Work Plan must be submitted no later than December 22, 2017. Click the web link above at "Additional Information" to learn about the site and how to comment. A copy of the application, Draft Remedial Investigation Work Plan and other relevant documents are available at: Buffalo & Erie County Public Library – North Park Branch, 975 Hertel Avenue, Buffalo, NY 14222. DEC has received a revised Brownfield Cleanup Program (BCP) application for a site known as Sid Harvey Industries Facility, site ID #C130087. This site is located in the Village of Valley Stream, within the County of Nassau, and is located at 100 East Mineola Avenue. Comments about the application must be submitted no later than December 22, 2017. Click the web link above at "Additional Information" to learn about the site and how to comment. A copy of the application and other relevant documents are available at: Henry Waldinger Memorial Library, 60 Verona Place, Valley Stream, 11582. New York State Department of Environmental Conservation - Region 6 Office is considering the issuance of GP-6-17-001 to replace the previously issued GP 6-12-001 which expired May 2017. This permit will be restricted to use solely by the OCSWCD and limited to use only within Oneida County, New York. Written comments on the draft general permit must be submitted to the contact listed above by December 22 or within 30 days from the date of this notice, whichever is later. DEC invites the public to comment about a proposed remedy to address contamination related to the 1130 Niagara Street Site (Buffalo, Erie Co.), within New York's Brownfield Cleanup Program. Public comments about the proposal will be accepted through December 22, 2017. Project documents can be reviewed at: Buffalo & Erie County Public Library - Niagara Branch, 280 Porter Ave., Buffalo, NY 14201; phone: 716-882-1537. On Saturday, December 23, 10:00 AM we’ll play some games and complete a craft focused on nature in winter, both animals and plants. All are welcome. Adults must accompany children. NOTE: We are unable to accommodate organized groups (scouts, schools, hiking clubs, etc.) at our public programs. Please call Five Rivers at 518-475-0291 to schedule a separate program for your group. Enjoy the beauty of the season on a guided walk in the woods. We will use snowshoes if there is enough snow. Snowshoe rental $5.00/person; Friends of Reinstein Woods members $2.00/person. Registration required; call 716-683-5959 to sign up. DEC invites the public to comment about a draft plan to investigate contamination related to the 260-262 Van Brunt Site (Van Brunt St., Brooklyn), within New York's Brownfield Cleanup Program. Public comments about the draft plan will be accepted through December 26, 2017. Project documents can be reviewed at: Red Hook Public Library, 7 Wolcott St., Brooklyn, NY 11231; phone: 718-935-0203 --and-- Brooklyn Community Board 6, 250 Baltic Street, Brooklyn, NY 11201; phone: 718-643-3027. DEC invites the public to comment about a proposal for "no further action" related to the 19 North Street Site (Buffalo, Erie Co.), within New York's Brownfield Cleanup Program. Public comments about the proposal will be accepted through December 26, 2017. Project documents can be reviewed at: Buffalo and Erie County Library, Attn: Carol Ann Batt, 1 Lafayette Square, Buffalo, NY 14203; phone: 716-858-7129. DEC invites the public to comment about a draft plan to investigate contamination related to the Bedford Union Armory Site (Bedford Ave., Brooklyn), within New York's Brownfield Cleanup Program. Public comments about the draft plan will be accepted through December 27, 2017. Project documents can be reviewed at: Brooklyn Public Library - Bedford Branch, 496 Franklin Ave., Brooklyn, NY 11238; phone: 718-623-0012 --and-- Brooklyn Community Board 9, 890 Nostrand Ave., Brooklyn, NY 11225; phone: 718-778-9279. DEC invites the public to comment about a draft plan to investigate contamination related to the Clearview Cleaners Site (Hillside Ave., Hollis, Queens), within New York's Brownfield Cleanup Program. Public comments about the draft plan will be accepted through December 27, 2017. Project documents can be reviewed at: Queens Public Library - Hollis Branch, Attn: Judith Todman, 202-05 Hillside Ave., Hollis, NY 11423; phone: 718-990-0728 --and-- Queens Community Board 12, 90-28 16sst St., Jamaica, NY 11432; phone: 718-658-3309. Explore the beauty of winter woods and learn how to identify local trees on this guided walk. Snowshoe rental $5/person; Friends of Reinstein Woods members $2.00/person. Registration required; call 716-683-5959 to sign up. Join us as we explore the winter world of our ponds. Children will participate in hands-on activities and games to discover how turtles, frogs, beavers, and more survive under the ice. For children in grades K through 5. Registration required; call 716-683-5959 to sign up. DEC invites the public to comment about a draft plan to investigate contamination related to the 990 Niagara Street Site (Buffalo, Niagara Co.), within New York's Brownfield Cleanup Program. Public comments about the draft plan will be accepted through December 29, 2017. Project documents can be reviewed at: Buffalo & Erie County Public Library, 230 Porter Avenue, Buffalo, NY 14201; phone: 716-882-1537. DEC invites the public to comment about a proposed remedy to address contamination related to the Highland Plaza Site (Tonawanda, Erie Co.), within New York's Brownfield Cleanup Program. Public comments about the proposal will be accepted through December 29, 2017. Project documents can be reviewed at: Kenmore Public Library, 160 Delaware Avenue, Kenmore, NY 14217; phone: 716-873-2842. DEC invites the public to comment about a proposed remedy to address contamination related to the 77-57 Vleigh Place Site (Flushing, Queens), within New York's Brownfield Cleanup Program. Public comments about the proposal will be accepted through December 30, 2017. Project documents can be reviewed at: Queens Library - Kew Gardens Hills, Attn: Susan Wetjen, 72-33 Vleigh Place, Flushing, NY 11367; phone: 718-261-6654 --and-- Queens Community Board 8, Attn: Matha Taylor, 197-15 Hillside Ave., Hollis, NY 11423; phone: 718-264-7895. Join us on Saturday, December 30, 10:00 AM for a two-mile round-trip will take us along field edges and into the woods. We may see wintering birds flying over the fields or grazing deer. We’ll experience both expansive views of open sky and the intimacy of dense forest. The terrain is flat but sometimes uneven. An additional half-mile on the Foresman’s Loop is an option. What do mice, rabbits, deer and birds have in common? They are all active in winter. As they go about eating, drinking, looking for shelter, and avoiding predators, the signs they leave behind tell a story. On Saturday, December 30, 2:00 PM after an indoor presentation on tracking, we will go out to decipher the clues that give us a glimpse of where animals have been and what they have been doing. 625 Broadway, Albany, NY 12233-7015, Phone: (518) 402-9625, E-mail: Guy.Bobersky@dec.ny.gov. This site is located in the City of New Cassel, within the County of Nassau, located at 31-33 Brooklyn Avenue and 30-36 New York Avenue. DEC invites the public to comment about the proposed deletion of the Tishcon Corporation Site (New Cassel, Nassau Co.) from the Registry of Inactive Hazardous Waste Disposal Sites (State Superfund Site Registry). Public comments about the proposal will be accepted through December 31, 2017. Click the web link above at "Additional Information" to learn about the site, why DEC is proposing the deletion of the site, and how to comment.